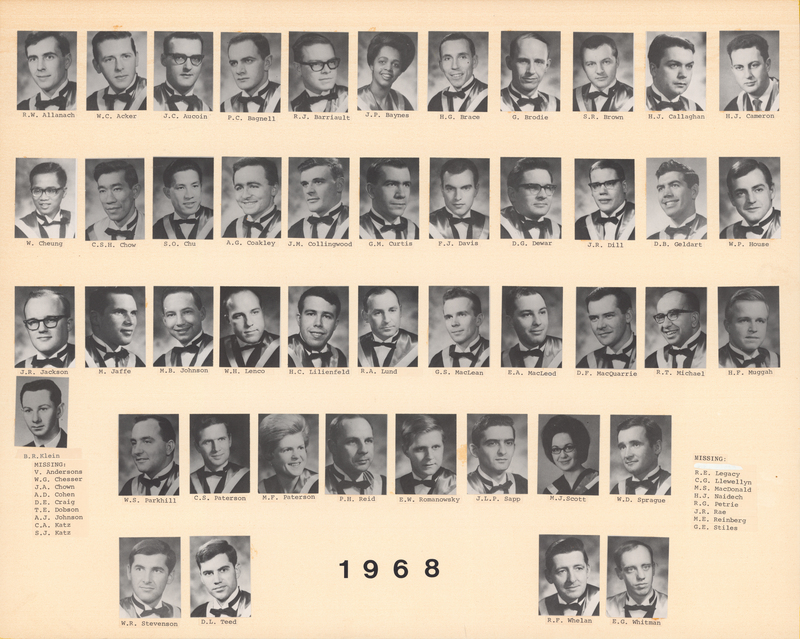 File is a composite photograph the Dalhousie Faculty of Medicine graduating Class of 1968. Photograph includes 46 individual portraits mounted on cardstock. Portraits include: R.W. Allanach; W.C. Acker; J.C. Aucoin; P.C. Bagnell; R.J. Barriault; J.P. Baynes; H.G. Brace; G. Brodie; S.R. Brown; H.J. Callaghan; H.J. Cameron; W. Cheung; C.S.H. Chow; S.O. Chu; A.G. Coakley; J.M. Collingwood; G.M. Curtis; F.J. Davis; D.G. Dewar; J.R. Dill; D.B. Geldart; W.P. House; J.R. Jackson; M. Jaffe; M.B. Johnson; W.H. Lenco; H.C. Lilienfeld; R.A. Lund; G.S. MacLean; E.A. MacLeod; D.F. MarQuarrie; R.T. Michael; H.F. Muggah; B.R. Klein; W.S. Parkhill; C.S. Paterson; M.F. Paterson; P.H. Reid; E.W. Romanowsky; J.L.P. Sapp; M.J. Scott; W.D. Sprague; W.R. Stevenson; D.L. Teed; R.F. Whelan, E.G. Whitman.